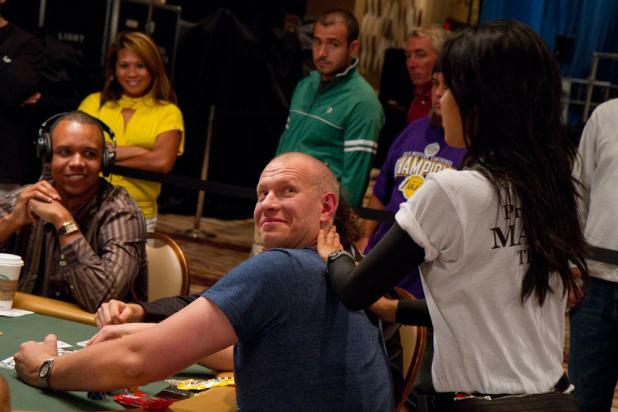 Phil Ivey (left) looks on as Greg "FBT" Mueller gets a massage during Event #10 ($10,000 Seven Card Stud). 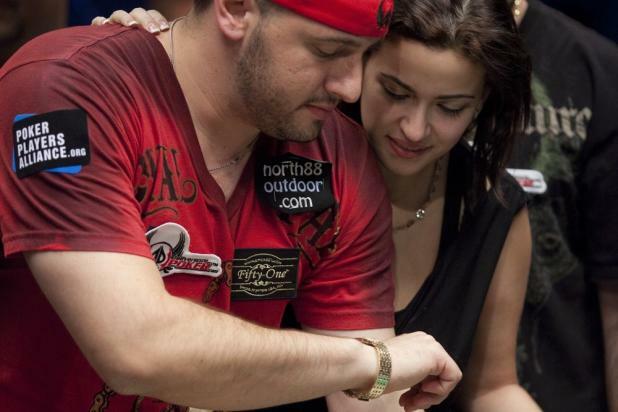 While there is total chaos around them, Michael Mizrachi and his wife Lily share a moment to admire the bracelet that represents so much more than first place in a poker tournament. 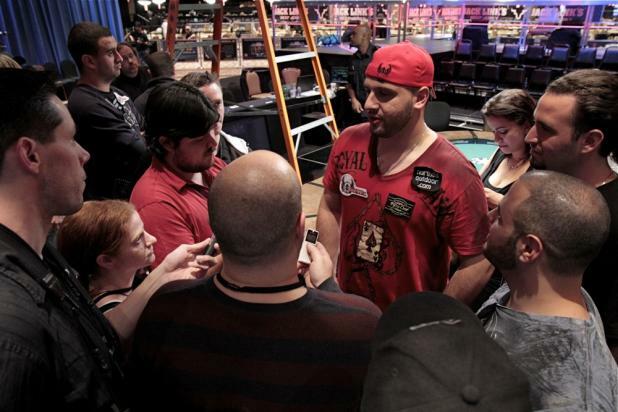 After ESPN got their on-camera interview, they started packing up their gear, and Michael "The Grinder" Mizrachi was surrounded by the poker media looking for quotes and answers to their questions. Mizrachi said, "If I was going to win a gold bracelet, I definitely wanted to win this event." When told he had previously been near the top of the list of best players to never win a WSOP bracelet, Mizrachi said, "Well, take me off the list, then." 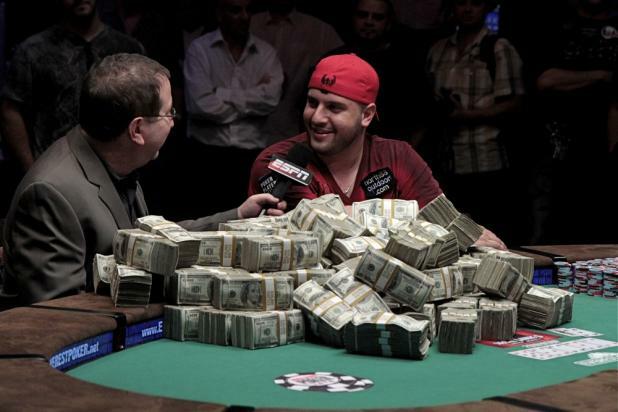 Minutes after his victory in the $50,000 Poker Player's Championship, Michael "The Grinder" Mizrachi sits down for a quick interview with ESPN's Norman Chad. When asked about the meaning of his victory in this unique event, Mizrachi said, "To win Chip Reese's Trophy is really special to me. I hope to be able to honor him in the way he deserves." 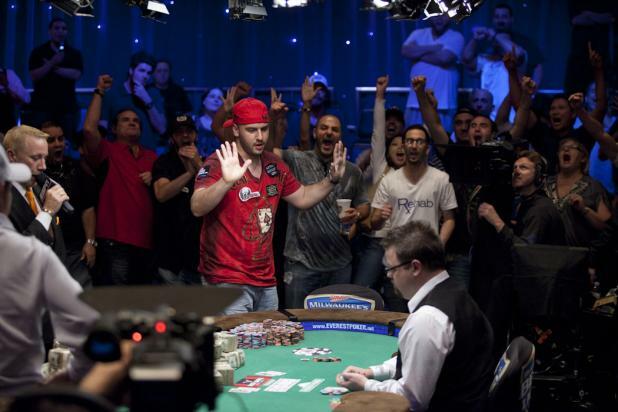 When asked about busting his own brother from the final table, Mizrachi said, "At least I put his chips to good use." 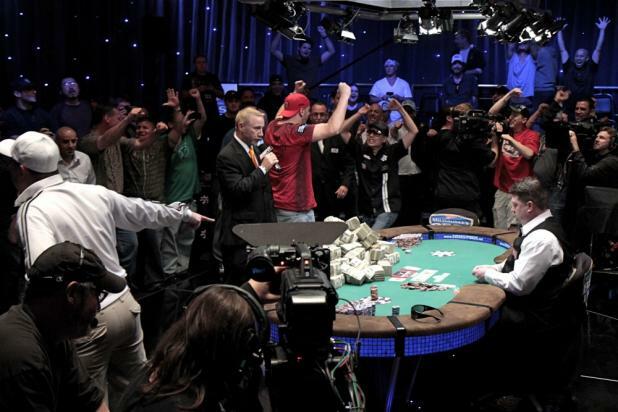 With the river card dealt (the harmless four of diamonds) Michael "The Grinder" Mizrachi celebrates his victory a split-second before his friends can see the card on the overhead monitor. 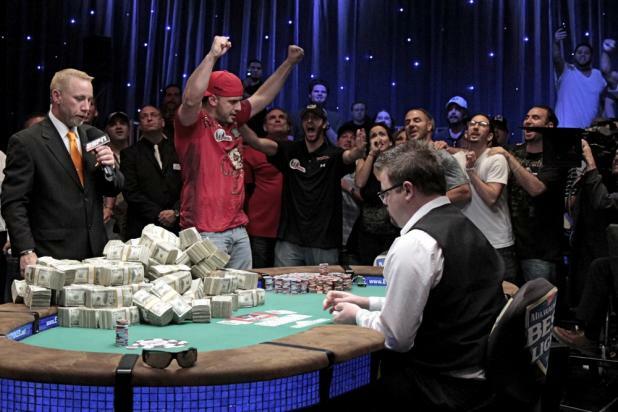 It took a few final table suckouts to get there, but that river card makes Mizrachi the 2010 WSOP $50,000 Poker Players Champion! Vladimir Schmelev was all in preflop with Q-8 against Michael "The Grinder" Mizrachi's Q-5, poised to double up after a flop of 9-6-4. But the turn card is a 5, and the Mizrachi cheering sections explodes in celebration. Mizrachi himself isn't ready to celebrate yet, because he knows that Schmelev picked up additional outs with a gutshot straight draw -- any seven or eight on the river will steal the victory away from Mizrachi. 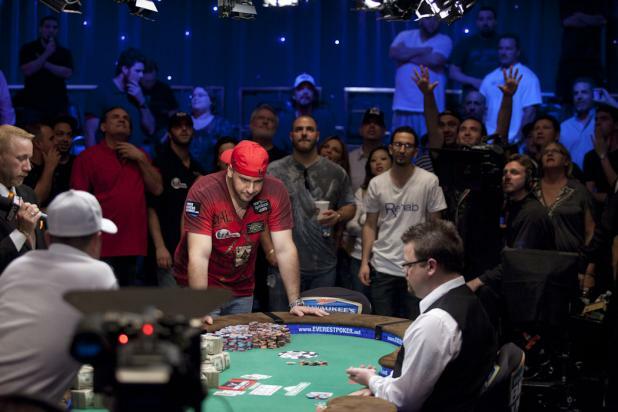 Once Michael "The Grinder" Mizrachi doubled thru Vladimir Schmelev to even the chip counts, he turned on the aggression that he is known for and started firing bets to win pot after pot after pot. When Mizrachi was finally forced to a show down in a big pot (Hand #231), he had the goods with trip threes. That hand crippled Schmelev down to just five or six big blinds. Mizrachi started moving all in after that, and Schmelev called with Q-8 in Hand #235. Mizrachi turned over Q-5. This photo was taken after the flop came 9-6-4, and Schmelev was a big favorite to double up. On media row in the ESPN Arena, reporters who work for competing outlets sit side-by-side and often discuss storylines and offer analysis. The reporters consider themselves to be peers even if they work for vastly different outlets. 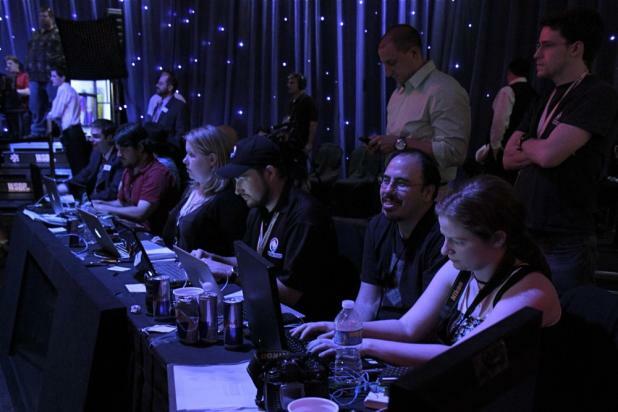 In this photo, there are reporters from PokerNews providing the live coverage available at WSOP.com, along with representatives from ESPN, the Associated Press, Bluff Magazine, and the Tao of Poker. 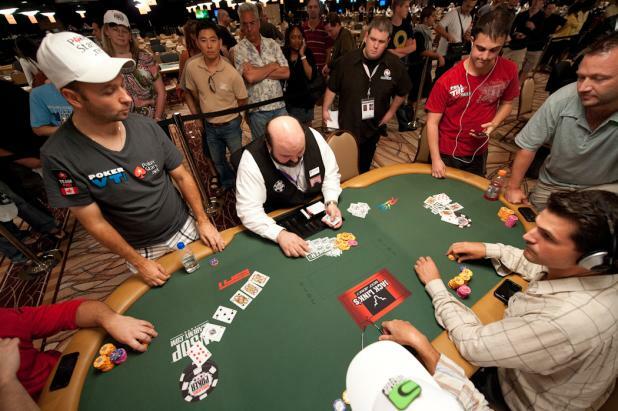 WSOP Tournament Director Jack Effel sits at the far end of media row, following the heads-up battle in the $50,000 Poker Player's Championship along with everyone else. Vladimir Schmelev (left, in white) had opened up a nearly 3-to-1 chip lead over Michael "The Grinder" Mizrachi (center, in red) leading into Hand #189. Mizrachi four-bet all in preflop with A-7 suited (clubs), and Schmelev didn't hesitate to call with A-J suited (diamonds). The flop came K-10-9 with two clubs, giving Schmelev a gutshot straight draw and Mizrachi a club flush draw. The queen of hearts on the turn gave Schmelev a straight and left Mizrachi needing a club to stay alive. When the five of clubs hit the river, both players reacted immediately -- Mizrachi with arms raised in triumph, and Schmelev pointing at the river card as if to cry foul. The two players were now nearly even in chips.